George Honchar (gbhbah@aol.com) has been a collector of Wain cats since 1997. I sent him a few written questions regarding his collection. Q. How did you get interested in Wain cats to begin? Q. What is special about them? A. 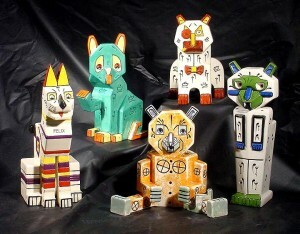 The ceramic cats are quite special and unique in their design, considering that they were produced in 1914. Know of anything else quite this avant and cubist from this era..? Keep in mind..nearly 100 years old. Think of these next to other objects of similar age….Amphora, Galle, etc. Quite revolutionary. Once you hold one in your hands, you’re hooked. Q. Tell me about your collection. Is one unique? A. Our collection of cats began by chance in November of 1997 at the New York Pier show. 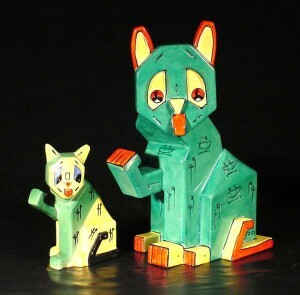 We had set our sights on finding a ceramic, and …totally unexpectedly ran into our first, the large Futurist cat (shown with the small Futurist cat), in the first 5 minutes of the Pier show opening. My hand landed on it a mere second before another buyer. We paid an astounding $1000 for it, but were quite pleased. Our collection grew to 10 cats, each quite unique in color and design. Current interest and the market has accelerated for both the large (12-14 inch) and the small (6-8 inch) ceramics since then. Several of the rarer small cats have gone at auction in England recently for as high as $8000 and a larger one in excess of 5 figures, although most recently some softening of prices has been seen. As a direct result of the escalation of prices, a copy has recently been found and pulled from an auction at a well-known British auction house. In the U.S. there is a small but motivated body of Wain collectors, for his ceramics, art and other objects…cards, period calendars,etc… so items that do come up for sale are aggressively pursued. Q. I hear that a book is being written about Wain cats. What information can you give me? 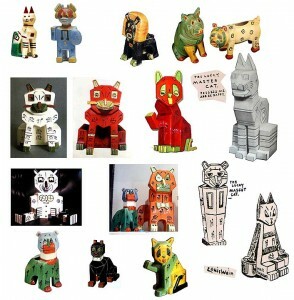 A. Cork Marcheski, a west coast collector is finalizing a definitive book on the ceramic cats, to be published soon. This entry was posted in Interviews and tagged Louis Icart, Wain cats by Philip Chasen. Bookmark the permalink. I was sitting at the lakeshore hear in Steuben county Indiana reading your blogs about celebrities and show etiquite. It stirred up some memories of my own from a few years on the Antique Show circuit. I have met Bozo the Clown at several shows. He is almost imposible to recognize out of costume but you are sure it’s him when he starts asking questions. One of my favorites. “Do you buy antiques?”. Hi, I just stumbled upon this article on Wain’s ceramic cats and really enjoyed the info. I never knew there were so many pieces existing! Looking forward to the book coming out. What I have always wondered is WHY Mr. Wain made such modernistic, almost abstract, ceramic pieces when his art always depicted beautiful cats (altho mostly in human clothing/situations). Remember the line of Beatrix Potter animals in porcelain that came out of England? This is the dream I have for Louis Wain cats. Why hasn’t someone put out a line of Wain porcelain cats showing them clothed and doing human things? The same company that did the Potter line would do it beautifully, I am sure. His art is so prolific, dozens of cats could be made, with no repeats! Do you know to whom I might suggest this line be made? Thanx. I live in wpb florida. I want to know where I can see your cats?